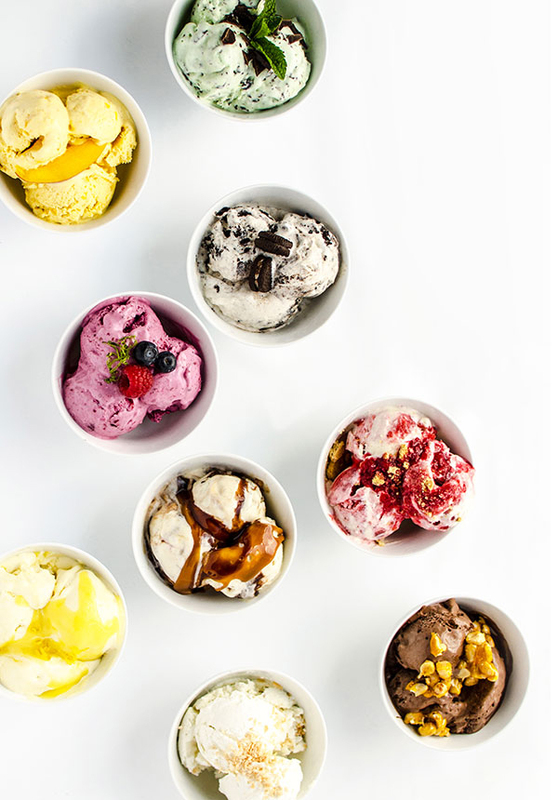 This blog isn’t called The Sweet Escape for nothing. Today I have a truly Sweet Escape for you. I can’t say that I’m necessarily on top of all the endless national food theme days but I’m all over it this time. 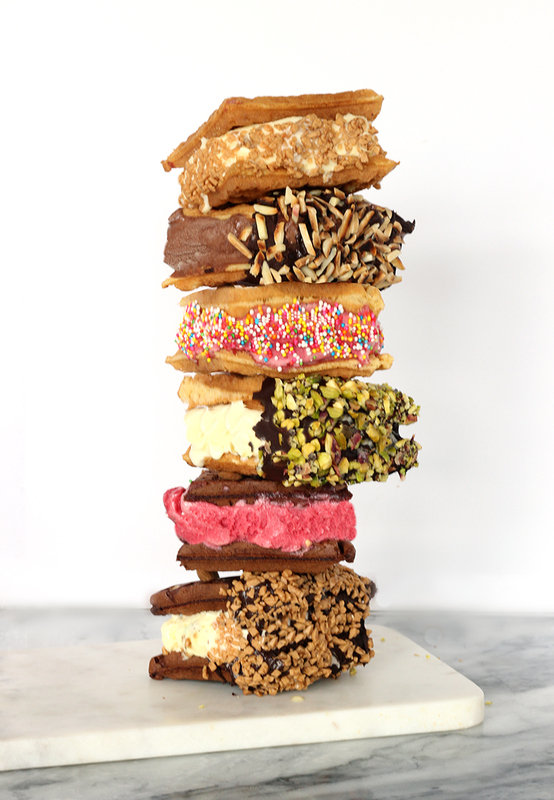 Did you know that today is National Ice Cream Sandwich Day? What’s not to celebrate about the genius who decided to bring together two already amazing things and combine them into one. Well folks, it’s time to add another amazing element to the game, waffles! 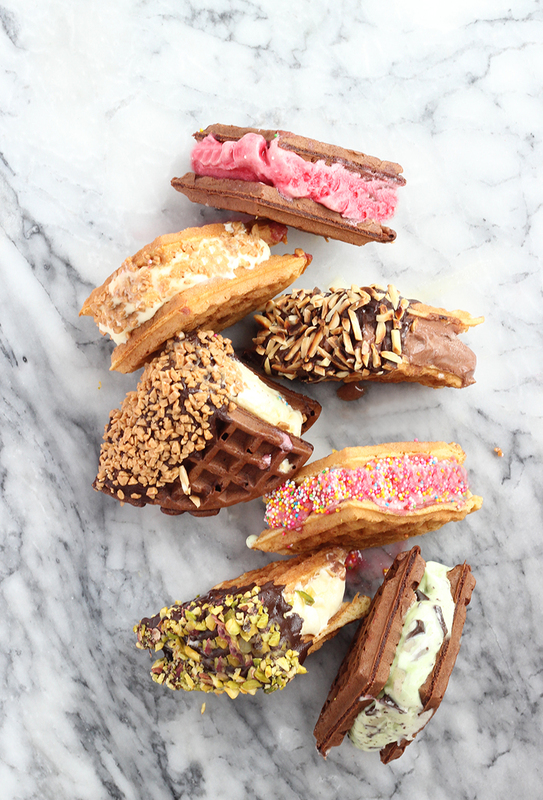 It’s time to celebrate with some waffle ice cream sandwiches! 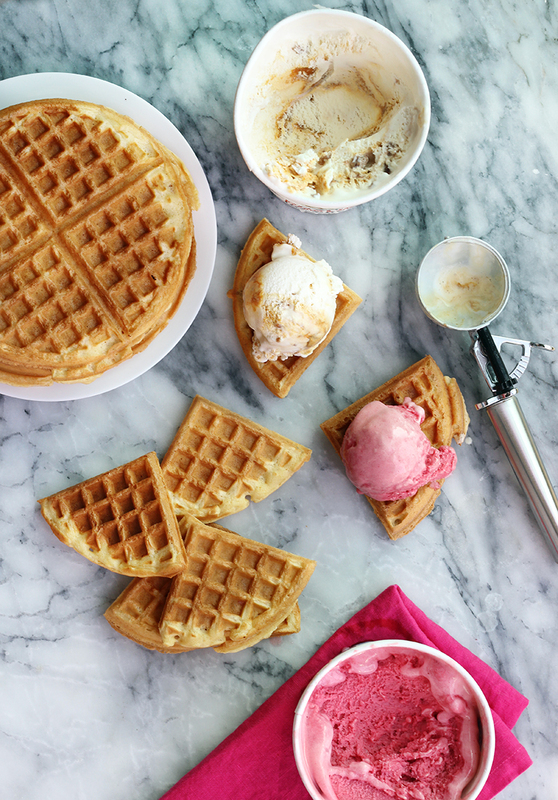 Waffles are perfect for ice cream sandwiches because they’re so cakey and delicious and all those nooks and crannies are perfect to soak up that delicious ice cream as it starts to melt, that is if you don’t devour it in 3 seconds flat. 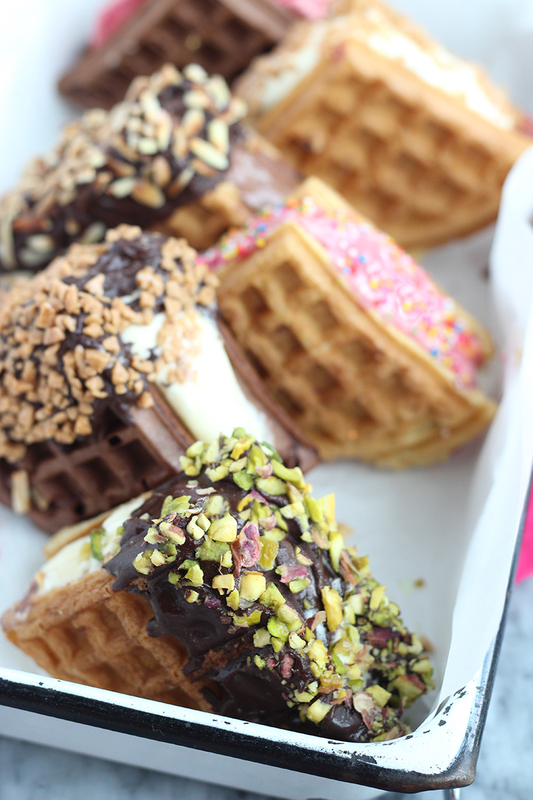 As if the waffles aren’t enough of a twist, try dipping your waffle ice cream sandwiches in some melted chocolate then rolling in your favourite nutty or sweet garnish. Ummmmm, yes please! Of course like any recipe, there’s the long version and the lazy quick version. 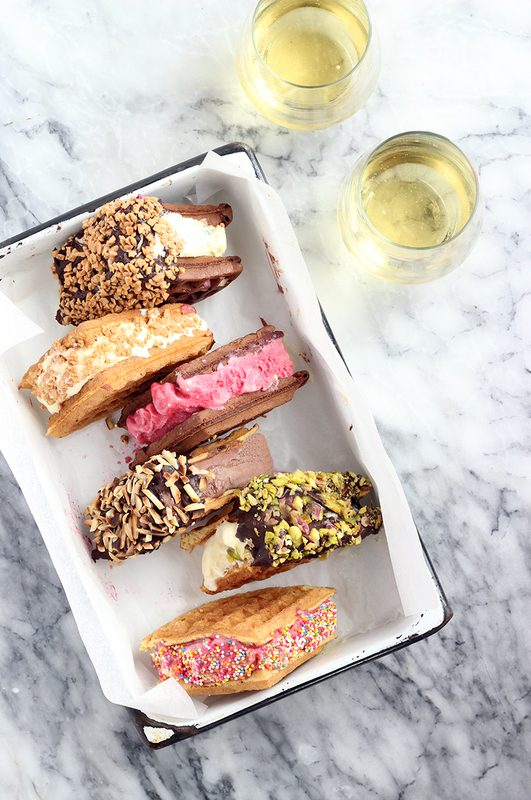 Visit my original post on the Kendall Jackson Blog for a great waffle recipe and either use your fave ice cream flavour(s) ORRR if you’re up for really having some sweet fun in the kitchen, check out our no-churn ice cream recipes from last Summer’s Merry Mag and whip up your own waffle ice cream sandwiches flavours. It’s kinda hard to go wrong with this one guys, there’s really no bad combo. Seriously you can have so much fun coming up with some mouth watering combos. As much fun as these are to make, you definitely need to give yourself a bit of prep time because it’s not exactly something you want to do while you’re guests are there. It’s really a 3-step process – 1. Make the waffles and let them cool, 2. 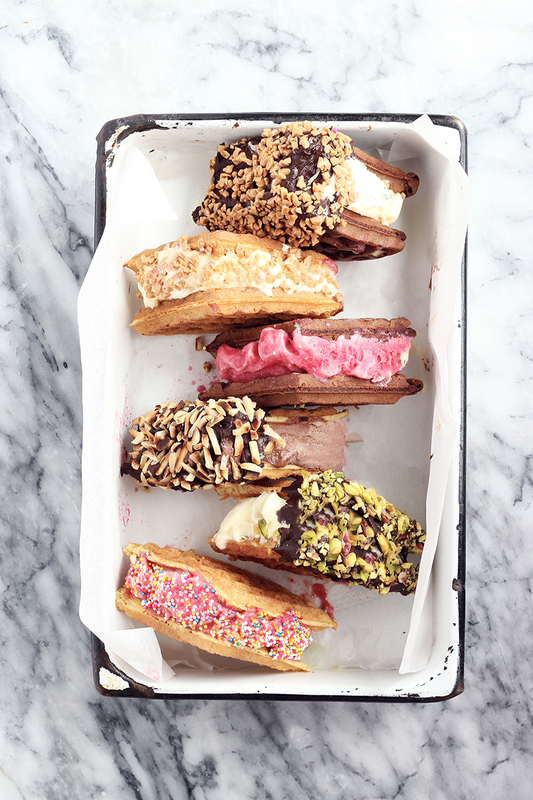 Sandwich a scoop of ice cream between each waffle pair then stick back in the freezer, 3. Chocolate dip and roll in topping and back in the freezer until you’re ready to serve. wheres the recipe for the waffles and the type of chocolate dipped on them? recipe please for the waffles and whats the recipe for the chocolate sauce? Is it ganache or a hard shell? Hi Linda, you can use any waffle recipe you like and I just melted some semi-sweet chocolate chips for the chocolate. Enjoy your waffle sandwiches! Hi there. My son would like to make your waffle ice cream sandwiches for his stall at the school fair. My question: Can we prepare them a day in advance and keep them in the freezer overnight? Thank you. Hi! Yes, you can definitely make them a day head. Enjoy!